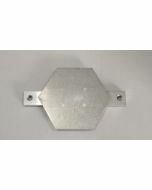 Evolution Import Atlas aluminium skid plate with oil drain cut-out cut 98%. Includes with installation kit. 3/16" thick. Oil drain cover available separately.